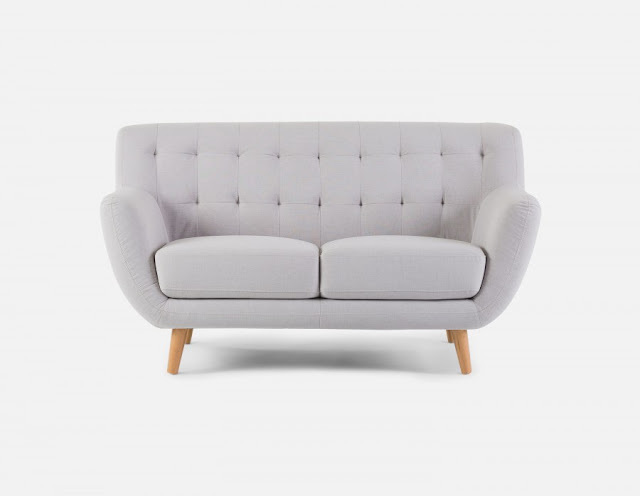 As far as I can tell, Structube is positioning themselves as a stylish yet affordable brand of furniture. 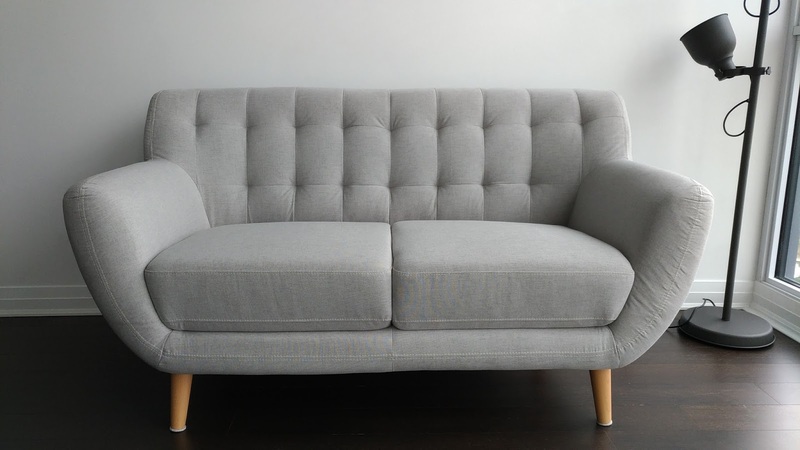 I've picked up a few things from them over the years, and here is the latest item I've tried: the Haley Loveseat (Silver). Condos are just getting more expensive and smaller as time goes by. 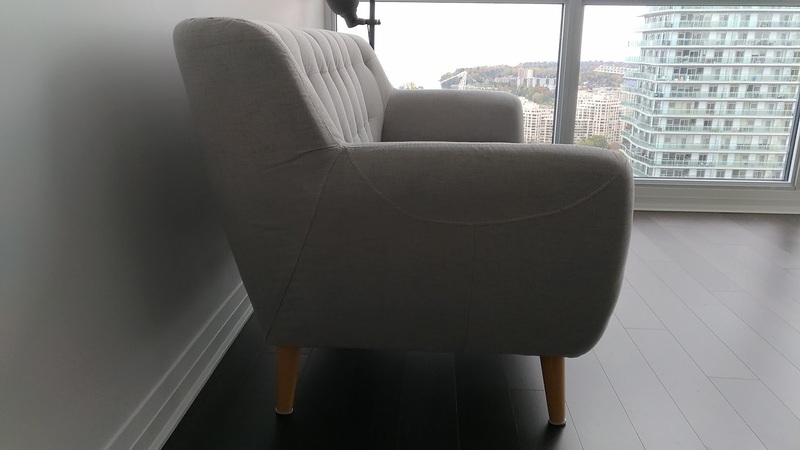 Condo builders generally try to design floor plans that optimize floor space, but at some point there's not much more that can be done; a small condo is still a small condo, and the best way to furnish a small condo is with small furniture (otherwise the space just looks/feels cramped). This is where the Haley loveseat comes in. 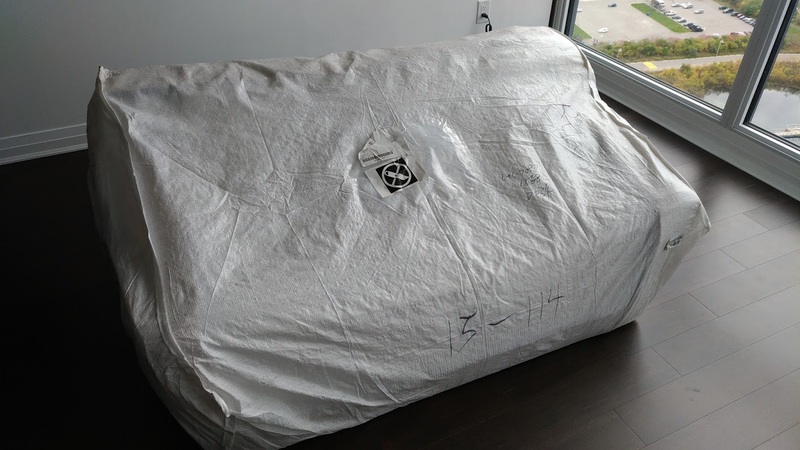 The delivery was pretty straighforward, and I was surprised at how easily the delivery guys were able to haul it around...Then I saw the weight of the loveseat: 70.4 lbs (32 kgs). At that weight I'd literally be able to lift it over my head! It comes protected in pieces of cardboard, foam wrapping and a plastic outer shell/bag. They weren't being particularly gentle with it, and the packaging seemed to do the job of protecting it. Installing the feet is simply a matter of screwing them all on in about 5 minutes. If you want to remove the plastic tips on the feet and replace them with felt pads like I did, then it'll probably take 10-15 minutes, as removing them wasn't the easiest thing to achieve. 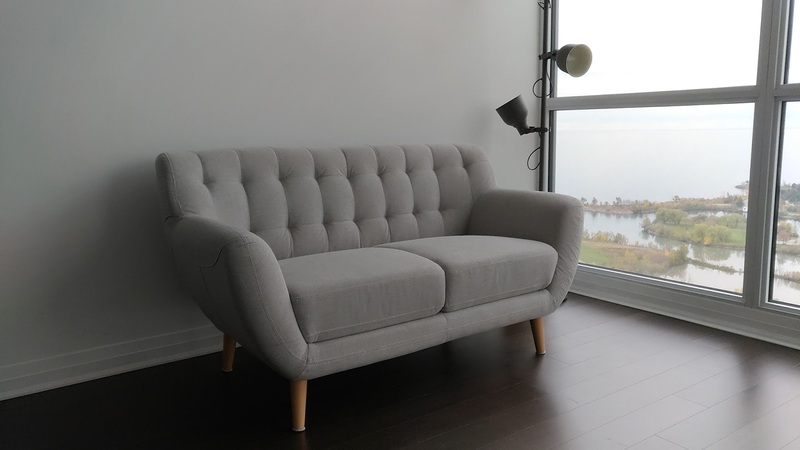 Sofa cushions are very firm, which is expected for a design like this (I'm sitting on it right now as I type this). It looks great and feels solid enough despite its relative light weight. Having said that I don't weigh 250+lbs, but two people sitting on it is fine. The only question is how durable the material will be, and when will it begin to show signs of wear and tear. At least on Day 1, it seems to be a solid loveseat so far, and as always I'll post updates if anything happens to it. The issue here is that the photos on the Structube web site is not exactly what you get. As you can see the real life photos show a slightly different shape. It may not bother you, but it is noticeable to those with a sharp eye for interior design and furniture. I'm thinking of ordering this loveseat today! What does the back look like? I would keep the couch in the middle of the living room so I would always see all sides of it. Thanks for your help! The back side is covered with the same material that you see on the front/sides, however I noticed that there is a zipper that runs down the back corner. It doesn't ruin the look of the couch from behind, but it's there.